TCM SID97-3E (again) | Tennessee Aircraft Services, Inc.
For those of you flying behind [or beside for most twins or behind and in front of for the “other” twins] a fuel injected engine built by Teledyne Continental Motors (TCM), you’ve probably had the fuel system adjusted at some point. Efficient and safe engine operation depends on this system being properly set up and maintained Only certified mechanics may perform this work so I won’t bore you with the detailed process. There’s still plenty you should know and knowing will help you comply with FAR Part 91 subpart E paragraph 91.403(a). If you’ve never had this engine set up performed, or don’t really know what I’m talking about, then you really need to keep reading. The TCM system uses the engine-driven fuel pump to supply a volume of fuel to the engine in excess of what the engine needs at any given power setting. The unused fuel is sent back to the tanks to be cycled through again. The engine rotation drives the pump, whose output is directly proportional to engine speed. 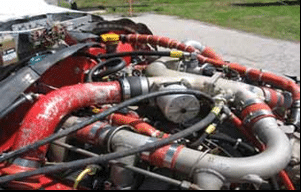 It might occur to you that engine power is not directly proportional to engine speed; this is an important detail in the fuel system setup and engine operation. The fuel requirements of an engine running at 2300 RPM when in cruise is much different than the same engine on final approach at 2300 RPM and the throttle pulled back to 15”. Incorrect fuel system set up may cause excessive fuel during low power operation or insufficient fuel flow for take off and climb. Excessive fuel could flood the engine on final approach. Low fuel flow on take off and climb may send the cylinder head temperatures out the roof. Either situation might significantly alter your travel plans for the day. Basically, this gear-driven fuel pump sends a volume of fuel at a particular pressure to a fixed orifice outlet. That outlet is the cumulative size of the six injector nozzles mounted above the intake valve of each cylinder. These injectors are, in essence, precise diameter holes that send a continuous aerated stream of fuel into the intake chamber. This flow is regulated by setting the low pressure and the high pressure output of the fuel pump. If these low and high limits are correctly set, then the fuel pressure provided to the system at all the intermediate engine speeds will also be within system tolerances. That’s right, pressure limits. Since the outlet diameter of the injectors is fixed, then any specific pressure will yield a corresponding flow. Back in the earlier days of small plane engine instrumentation it was generally easier, less intrusive, and less expensive to measure pressure as opposed to flow. That original Cessna fuel flow gauge with the needle in your injected TCM powered plane is actually a pressure gauge calibrated to display fuel flow. Troubleshooting tip – if a fuel injector is restricted for some reason, the system fuel flow will decrease; however, this restriction causes system pressure to increase, which will display on that old analog fuel flow gauge as an increase in fuel flow. The TCM system is a continuous flow injection system. That means the nozzles do not open, and close to spray fuel only when the intake valve is open. They send a continuous stream of fuel into the intake valve chamber all the time. The fuel mixes with the air while they wait for the intake valve to open, then the mixture gets sucked into the cylinder for combustion. You can imagine the amount of fuel sent must be very precisely measured out for a good even combustion event. We’ve repeatedly worked over the concept that an airplane operating under FAR Part 91 does not have to comply with service bulletins, which is true. However, the regulations do state that aircraft maintenance must be performed to the manufacturer’s procedures. The difference is that one doesn’t have to perform the work WHEN the manufacturer says but if the work is performed it must be done HOW the manufacture says. Paraphrased – All work SHALL be performed per the current maintenance manual and one SHALL use the equipment called for by the manufacturer. The regulation is pretty unambiguous and doesn’t leave room for side stepping procedures or using sub-standard equipment. This isn’t a suggestion or just general guide lines, it’s FAA regulations. Keep that in mind as we go through some of the high points of TCM’s SID97-3E. TCM has a published Service Information Di- rective (SID) 97-3 that gives information on when and how to perform adjustments on their injected fuel systems. SID97-3 was originally issued in March of 1997 with the current revision issued in June of 2008 as SID97-3E. It is the primary document for procedures and specifications to adjust the fuel injection system. It also refers to the associated maintenance manual for some items. Near the top of the document is the Compliance statement where TCM tells us when they would like this work performed: “At Engine Installation, 100 hour/Annual Inspection, fuel system component replacement or as required if operation is not within specifications.” The ensuing 38 pages will detail how to do the work and with what tools. Before any work can be done, one must know what tools are required. Paragraph A of the SID details the special equipment one must have on hand. The first piece of test equipment listed is the Model 20 Porta Test unit p/n 630045-20 ATM-C manufactured by Aero Test, Inc. It is a large box with large, precise, analog gauges and a couple of valves. The last price I saw for a new version of this box was $4,800.00, but when I called about it there were none in stock. Fortunately, the next sentence of the SID states that we can use calibrated gauges instead of the Porta Test box. Every solution has its problems, as is the case with calibrated gauges. 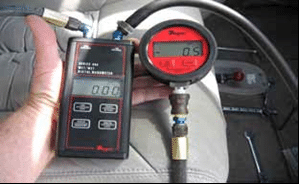 The SID details the specifications for these calibrated gauges which will not likely be satisfied by anything you might find at the local auto parts store. The first gauge has a range from 0 to 60 p.s.i. and must read in 1 p.s.i. increments for the unmetered fuel pressure. The second has a range of 0 to 30 p.s.i. and must read in 0.2 p.s.i. 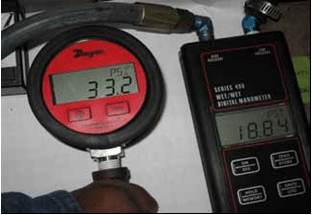 increments for the metered fuel pressure on normally aspirated engines. The third gauge requirement is the least common and most expensive; a 0 to 30 p.s.i. differential pressure gauge reading 0.2 p.s.i. increments for turbo charged engine metered fuel pressure. All of these gauges must be accurate to +- 1%. The differential gauge is the most difficult to find and to afford. It is required on turbo charged engines because the metered fuel pressure is referenced to the upper deck pressure. The upper deck is the area of the engine air induction system just before the throttle valve. Most pressure gauges read a pressure relative to the ambient pressures. The differential gauge has a second port which is connected to the upper deck of the engine so measured pressure has the same reference point as the fuel injectors. The $4,800 Porta Test unit is a definite budget buster for my shop as well as most shops working on position singles. Purchasing individual analog gauges wasn’t too bad but the differential gauge has proven to be almost unobtainable. There must be a better way so I called a friend at TCM to see if they had any viable alternative. Sure enough they did in the form of a couple of digital gauges. 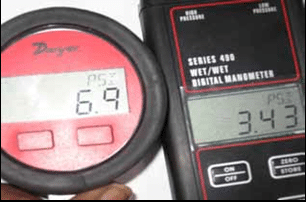 The Dwyer Instruments Model DPGWB-08 is a digital pressure gauge that reads 0 – 60 p.s.i. with 0.2% accuracy for reading the unmetered fuel pressure. The real find is the Dwyer Instruments Model 490-2 digital differential pressure gauge reading 0 – 30 p.s.i. for the meter fuel pressure. By leaving the low pressure port open to ambient pressure it can also be used for the normally aspirated engines. The big news is that these digital gauges can be purchased for less than $400.00 for the pair, which should be well within the reach of most any shop. WARNING USE OF INACCURATE GAUGES WILL RESULT IN INCORRECT ADJUSTMENT OF THE ENGINE FUEL SYSTEM, POSSIBLE CYLINDER WEAR DUE TO LEAN OPERATION, PRE-IGNITION, DETONATION, LOSS OF POWER AND SEVERE ENGINE DAMAGE . The process is not terribly complicated but must be performed in sequence for correct results. Even on engines that require a lot of adjustment, the set up only takes 2 or 3 hours per engine. If it’s practical, you can achieve the best results by first flying the plane to warm the engine. The aircraft gauges should be checked for accuracy before any fuel adjustments are made. Original equipment analog tachometers are notoriously inaccurate and should be verified with a hand held digital strobing tach or equivalent. Any digital tachometer installed as part of an STC will be very accurate. Pre-run preparation includes attaching the gauges, purging the fuel lines, cleaning fuel screens, verifying air filters are clean, and backing the idle speed set screw a couple of turns. The idle speed will be controlled by the throttle lever for the first part of the test. Install the engine cowling for cooling during the runs. Take all safety precautions, and chock all three wheels. The engine is run and set to the proper idle speed to note the unmetered fuel pressure. Then the mixture control is slowly pulled back towards idle cut off to note the RPM rise (if any). After that, full rich mixture and full power is applied so the metered fuel pressure may be recorded. The readings are compared to the appropriate table in the SID. If any are out of tolerance, the entire system setup is needed. Adjustments start with the idle speed unmetered fuel pressure. It is best to have this set to the minimum allowable pressure for best idle mixture and maximum part throttle full rich fuel flow. Idle mixture is now checked by adjusting for an rise of 25 to 50 RPM during mixture cut off. More than 50 RPM rise indicates the mixture is too rich and less than 25 RPM or no rise indicates too lean. the FULL POWER fuel flow should be set to the maximum specification limit. All these adjustments require a fine touch to get the desired results. Don’t be surprised if several engine runs are required and be diligent to keep the cylinder CHTs below. If the temps get too high, then shut down the engine and let it cool a bit. After all the adjustments are made, return to the idle and set the idle screw to stop the throttle at the proper idle speed. Double check the idle mixture and idle unmetered fuel pressure. All is set, so we’ll remove the equipment, reconnect all the fuel lines, perform appropriate leak checks and reinstall the cowling. Last job is to perform a flight check. This is to confirm that inflight readings match the ground runs. If any reading is out of norms, the set up process must be repeated. Typical operational indications that your engine needs this procedure is that it stumbles at full rich on final approach, or quits on landing roll out, or doesn’t get enough fuel for cooling at takeoff power. If your mechanic suggests that any of these symptoms are just how some of these engine run, he/she may be covering up the fact that they are not equipped to perform the test. Because of the high cost of this box or lack of understanding of the importance of correct engine set up, SID97-3E is often not followed by maintenance facilities. Some mechanics may try to convince you they can do the fuel system set up using the aircraft gauges but you now know better. You want your engine to run correctly and efficiently so it is up to you to ensure this gets done, and done properly when needed.